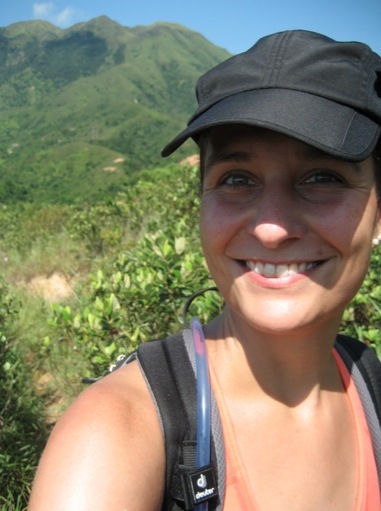 A few days ago I decided to hike on Lantau again. There was no MeetUp group meeting that I wanted to attend, so I just decided to go on my own. Given it was broad daylight, there were lots of hikers out there, I had enough water and a map plus my RoadID (a tag with key information about me) I felt it was no problem to hike on my own. It truly wasn’t and I met a few nice fellow hikers during the hike. Overall I hiked 18km in just about 5 hours that Sunday. I split the hike in three parts. 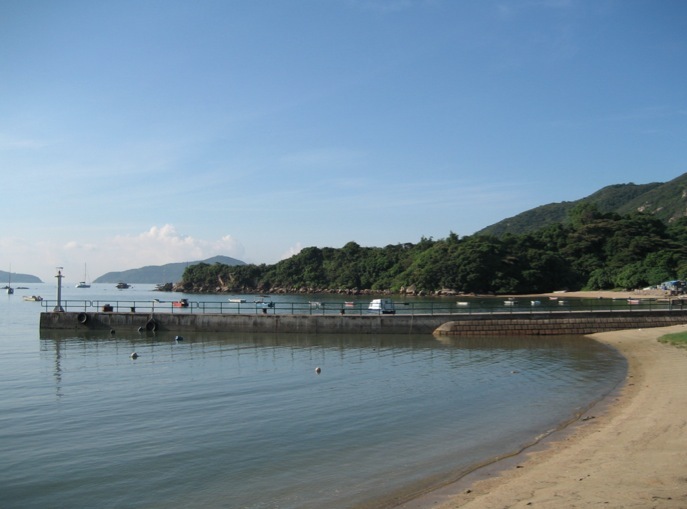 First it was the usual way from Discovery Bay to Mui Wo, along the Trappist Monastery. This takes me about an hour and is the easiest part. I just walked along Nim Shue Wan, past the houses, and then climbed the shaded path to the Monastery (sadly, there are no more cows as the milk is produced in mainland China) and then all the exposed way up to the gazebo at the top. 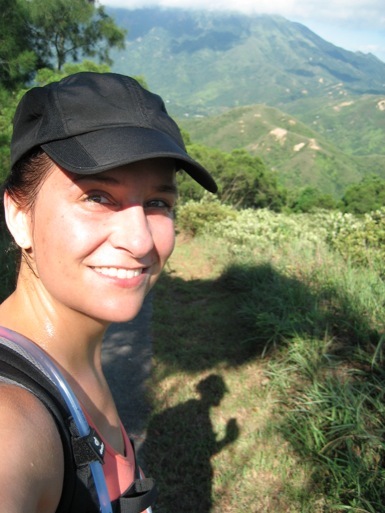 By the time I reached the top, I was soaked in sweat – it was another one of those hot and sunny days. Luckily there was a small breeze on top, so I waited a little bit to cool down, before following the path downhill. I walked all along the beach and Silvermine Bay – which was quiet at 9am in the morning. But I’m sure that one hour later it must have been packed with children running and playing, volleyball players in the sun and the first BBQ slots being reserved for a big grill feast at lunch time. After crossing the river, I turned away from the sea to the right. 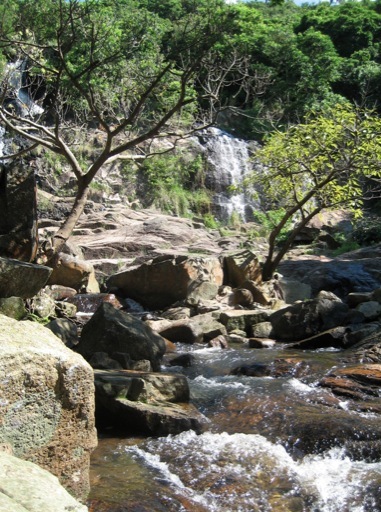 Walking past the houses to the end of the street, I turned right again towards the direction of the Mui Wo waterfall. I passed a few new houses that were just being built, very modern but true to the original village style houses. 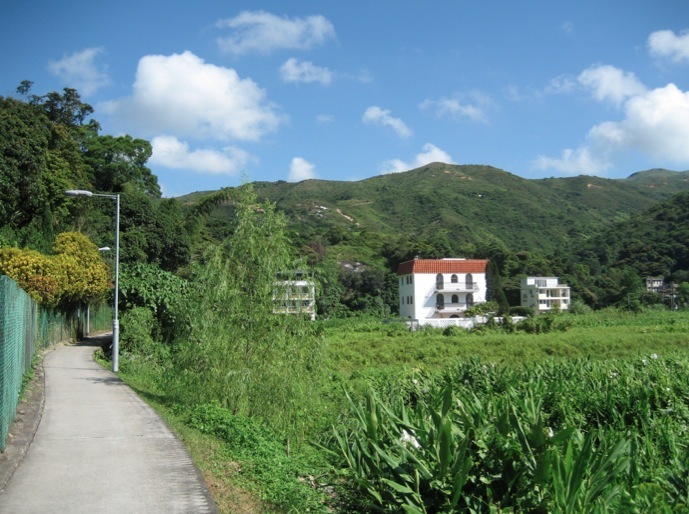 There was one junction at which I turned left and walked past the fields – many of the houses in this area of Mui Wo have their own garden to which they tend to. 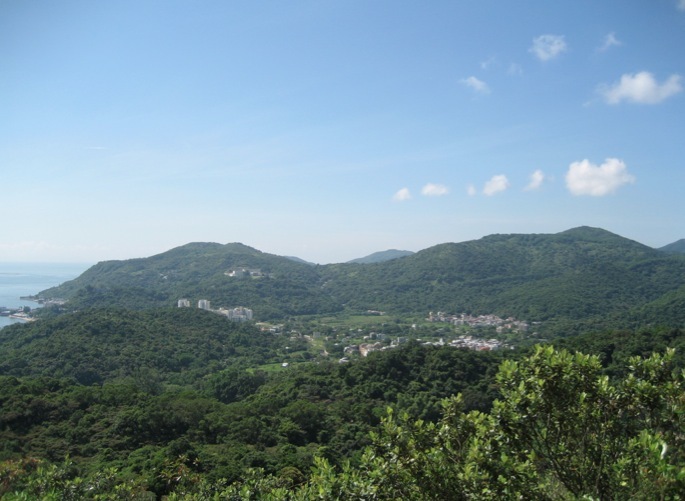 Lots of vegetables seem to grow there, it must be a good soil – maybe it is the cow dung from the wild cows that sometimes visit Mui Wo? Following the trail for a few minutes, I came to a spot where the official 2008 Olympic Trail started. 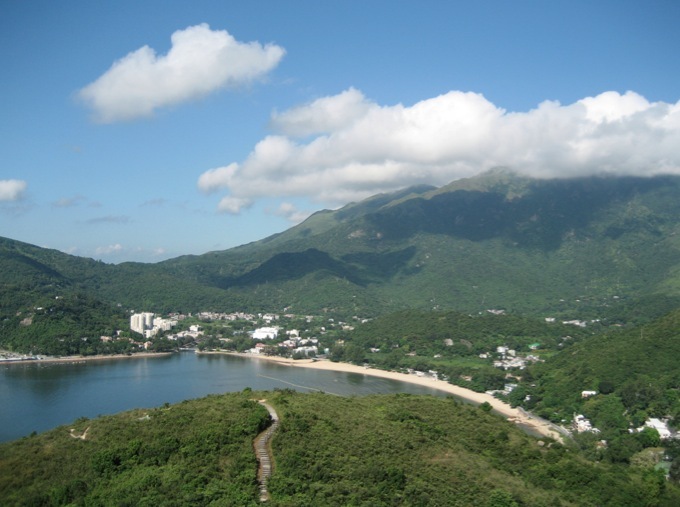 This was the one I had taken a few weeks ago to walk from Tung Chung to Mui Wo. Now I was walking some parts backwards of it. First, I stopped at the water falls. 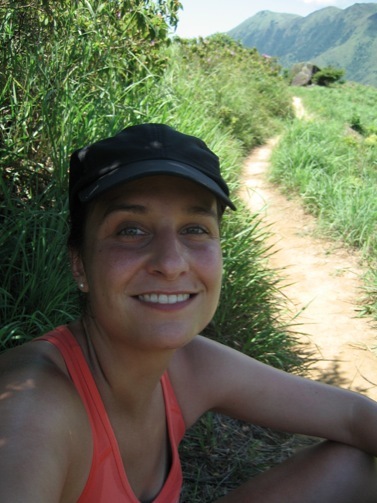 This was the start of the second part of the hike, so I decided to rest – I sat next to the water and ate my sandwich. It was calm and quiet, just three other people visited the spot. Not like weeks ago when it was packed. I’ll then continued on the path uphill, which is easy as it is broad and paved. Quite a few fellow hikers and joggers joined me on this part. 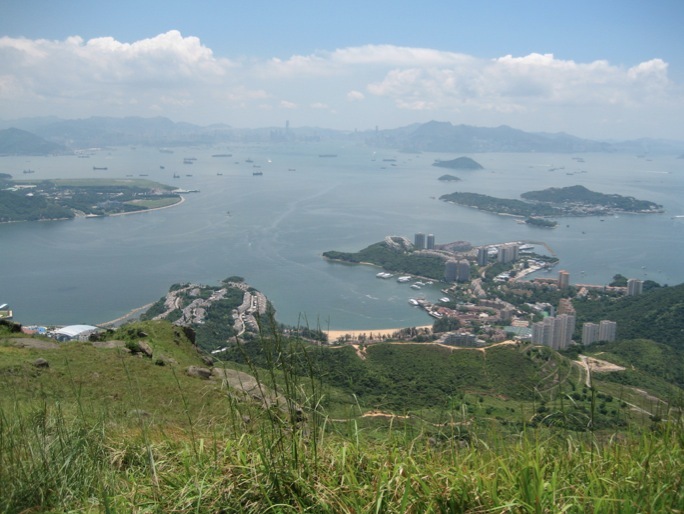 The best part was the view – over to Mui Wo but also to Lantau Peak. I kept walking on the Olympic Path but then I saw a small footpath off to the East. I had no idea where it was going, there was no sign or anything, but I hoped it would lead to Discovery Bay. I started out on the track but after 20 mins noticed that it just went to a rocky part in the hills from which no path was going further to the East. At least none that I could find. So I had to turn around and walk back again, to find the Country Trail to the Tiger’s Head. 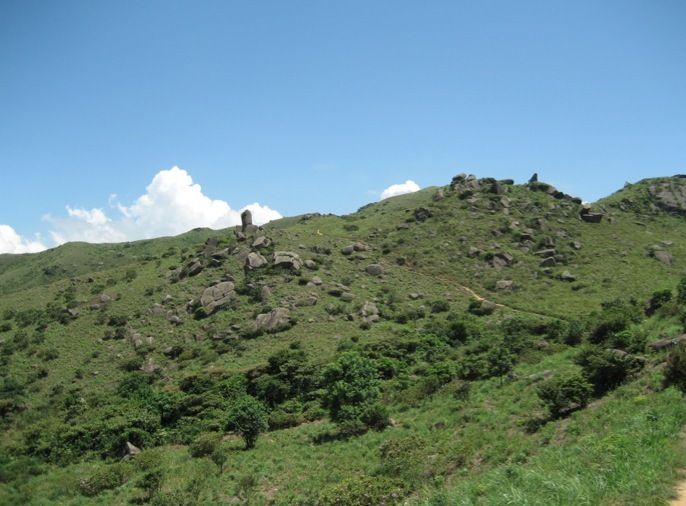 Here, the hills are studded with clusters of huge boulders – Rock City. 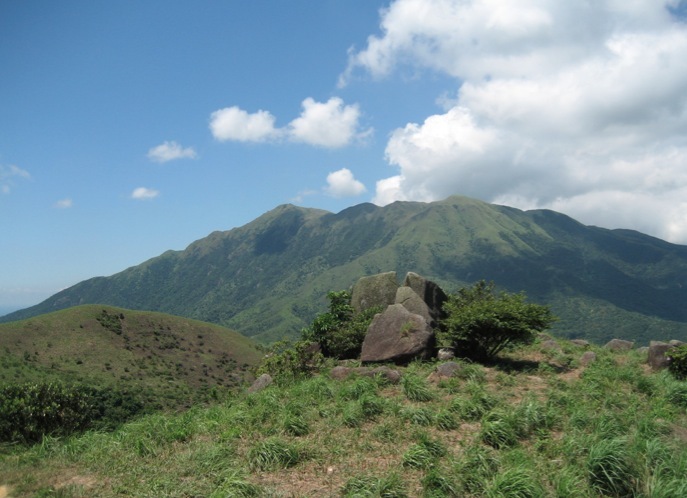 There are rocks that look like a huge peach, a noon and even a duck sitting on the ridge. I wish I had taken more photos to show this. 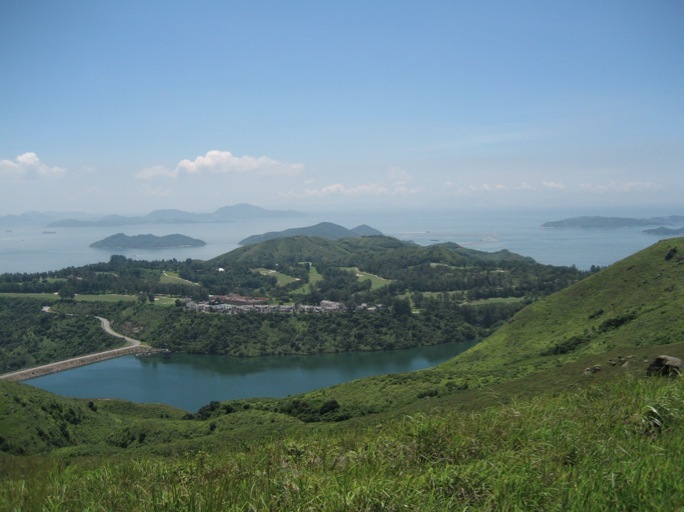 The trail has some amazing views over Mui Wo, the airport and Discovery Bay – you can even see the golf course and water reservoir. I sat down and had a quick break, catching my breath and eating some fruits. 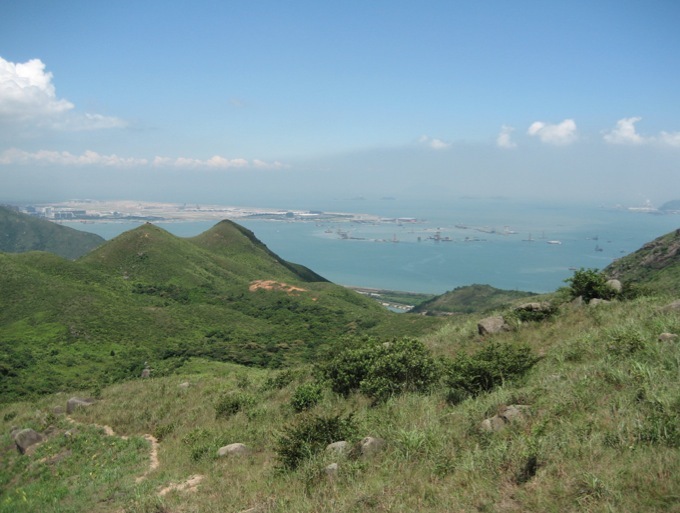 I reached the Tiger Head and from there it was 45 min steep down – with amazing views over Discovery Bay, Lantau and the South China Sea. 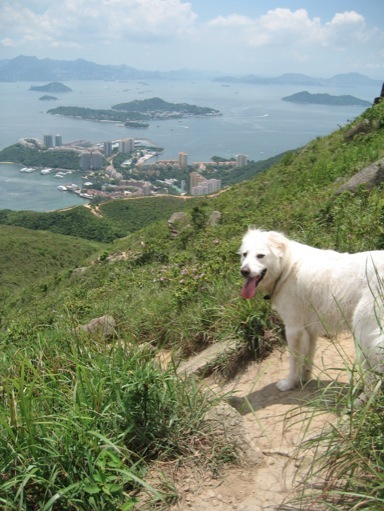 For parts of my hike I was joined by this white fellow, a friendly dog who hiked with me rather than with his owners. He kept watching where I put my feet and stopped every few minutes to see if I was doing ok… that was until we hit another water stream and he just ran to jump right into it. I could have done the same, it was so hot and sunny!